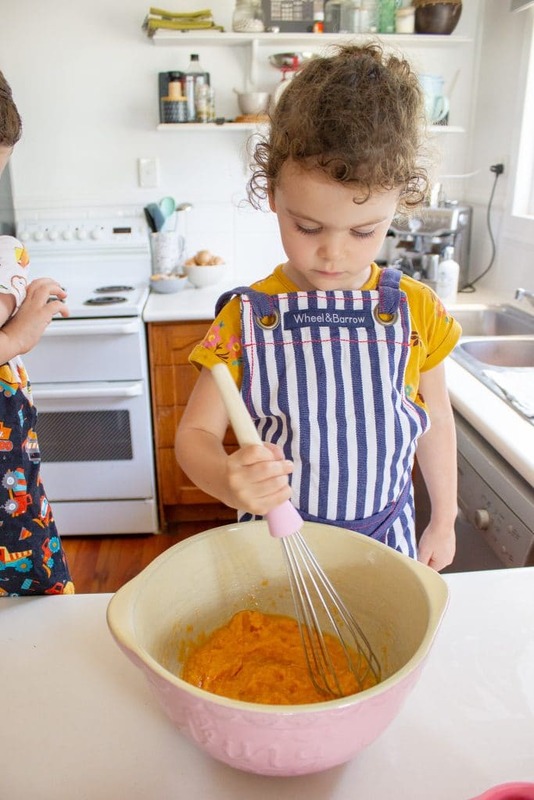 Do your kids enjoy sweet potato? Mr 3 is a sweet potato fiend. It’s one of his favourites. Miss 3 doesn’t mind them either. But Mr 7 has not had a piece of sweet potato between his lips since I don’t even know when. But you know what? When I offered him a slice of this Healthy Sweet Potato Blondie, he didn’t hesitate. And he adored them. And I feel like that is even an understatement. He loved them. Luuuurrvvved them. And I do too. 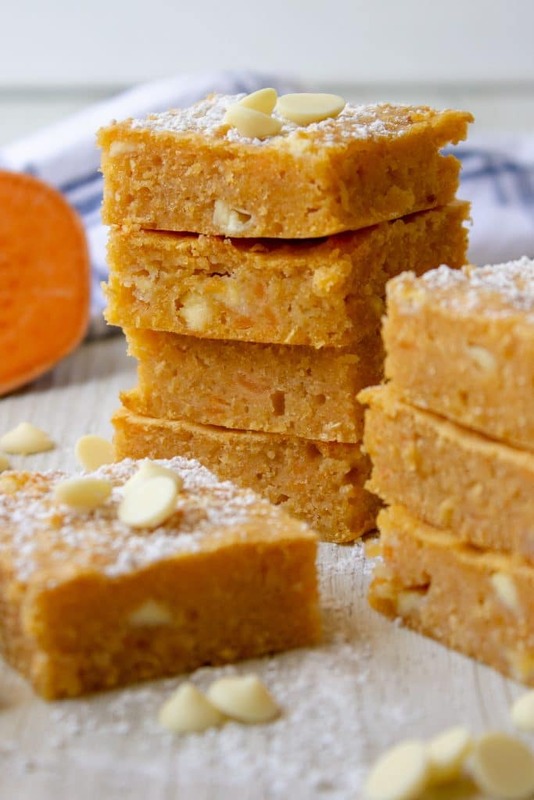 These Healthy Sweet Potato Blondies are all kinds of amazing. 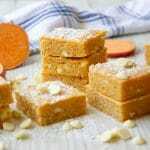 This healthy blondie recipe tastes quite sweet but they’re actually comparatively low in added sugar. 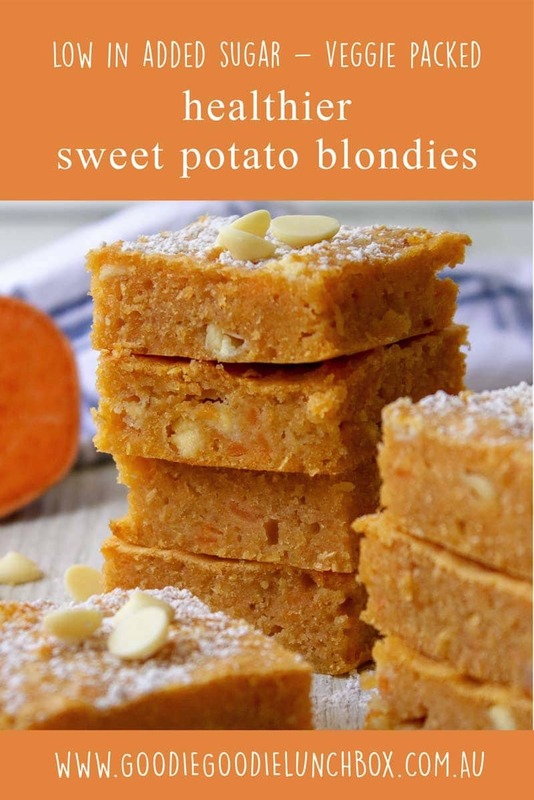 There is only a small amount of maple syrup and white chocolate chips added to this recipe – 1/3 cup of each and it’s largely sweetened by the sweet potato. This is a huge reduction in sugar compared to some recipes that can have up to 2 cups of white sugar and 1 1/2 cups of white chocolate. And none of the nutritional benefits of the added sweet potato. 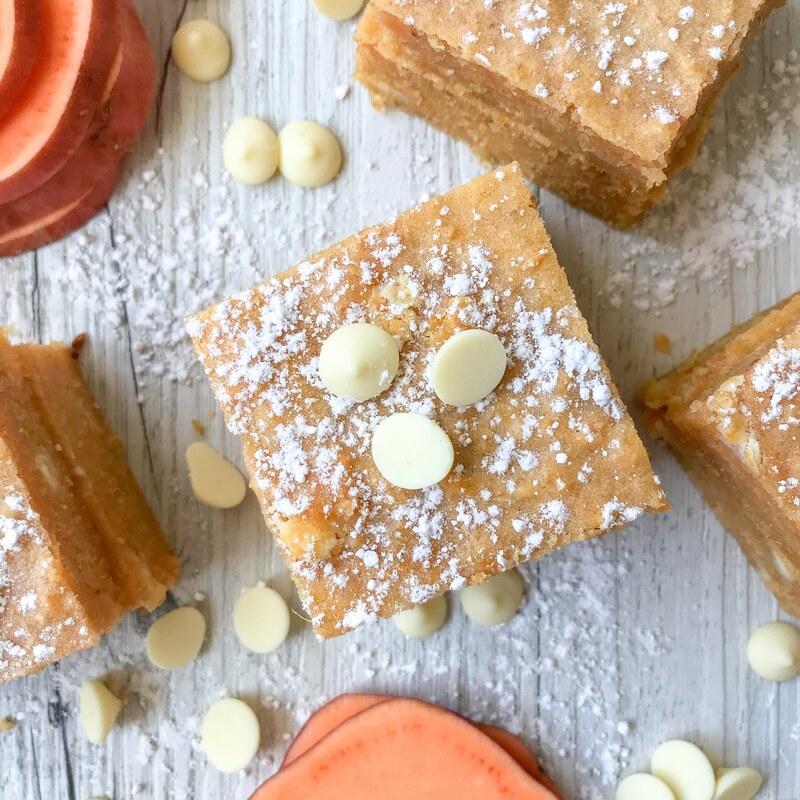 I love to add veggies to baking to give it that extra boost and I love the extra fibre and vitamin c the sweet potato brings to these Healthy Sweet Potato Blondies. This moist and soft healthy blondies recipe comes together pretty quickly too and the recipe is simple enough to make this with your kids. The twins loved helping to make this, especially being quality control for the white chocolate. I especially think it’s important to let your kids get in on the baking action when you are baking with vegetables to normalise the different ways of enjoying vegetables. Love the idea of these Healthy Sweet Potato Blondies? You’ll adore my Delicious Chocolate Brownies with a Healthy Twist or if you’re looking for more recipes with an added veggie boost why not try my these Nut Free Carrot Cake Bliss Balls or these Dairy Free Pumpkin and Coconut Muffins. 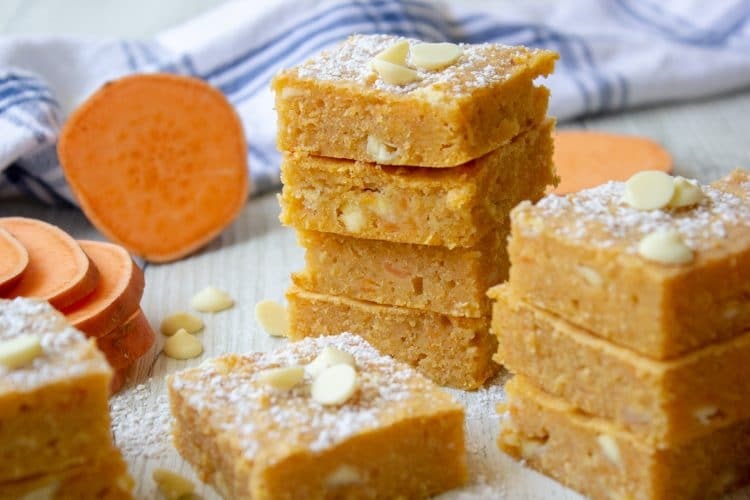 These delicious Healthy Sweet Potato Blondies are a healthier take on blondies. Lower in added sugar, made with wholemeal flour and a generous serve of sweet potato, these blondies are a must bake. To make the sweet potato, boil in as little water as possible for around 15 minutes until soft and cooked through but not overly mushy. Drain any remaining water then mash the sweet potato and set aside to cool before making the blondies. I hope you love these Healthy Sweet Potato Blondies as much as we do. Remember to get social with me – take a pic with your baked goodies and share with my on Instagram or Facebook. Is it ok to double this recipe please? Thinking it would make a great snack for the kids at daycare! Love your blog :D. I have a question, what can I use instead of the white chocolate chips? Thank you very much! Do you think it would work out OK egg free? Hi, what else could I use instead of the plain wholemeal flour? Would self raising or plain flour work? Thanks heaps!